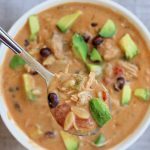 A creamy chicken soup with orzo and green chiles. It’s got cream cheese and avocados for creaminess and lots of flavor from diced green chiles and salsa verde. An easy dump and go recipe. Add broth, salsa verde, black beans, chicken, green chiles, tomatoes, chili powder, cumin and smoked paprika into the slow cooker. Cover and cook on low for 4-6 hours for thawed chicken or 6-8 hours for frozen chicken. Remove the chicken and place on a cutting board. Shred the chicken or cut it into bite size pieces and add it back into the pot. Add in the cream cheese and the uncooked orzo. Turn your slow cooker to high and cover. Let the orzo cook through and the cream cheese melt for about 30 minutes. Once the orzo is cooked through taste test and salt and pepper to taste. Ladle the soup into bowls and serve topped with avocados. Gluten free option: to make this soup gluten free leave out the orzo. You could substitute the orzo with cooked rice. I haven’t tried it yet but think it would also work to add a half cup of uncooked rice into the slow cooker at the beginning and let it slow cook.